The extraordinary output of regulation set in motion by Dodd-Frank should, five years after its enactment, give us pause. Such a large and sudden addition of regulation of the financial sector has doubtless increased the complexity of financial regulation, and it is remarkable that such vast changes were accomplished in a relatively short timeframe, for better or worse. Whether this increased government involvement in the financial sector will prevent future crises or exacerbate them remains to be seen. On July 21, 2010, the Dodd-Frank Wall Street Reform and Consumer Protection Act was signed into law as a response to the financial crisis of 2007–08. The statute, which itself was 848 pages long, directed dozens of regulatory agencies to revise or create new regulations addressing the financial system in the United States. Those agencies responded with hundreds of new rules that will govern financial markets, on a scale that vastly exceeds any previous regulation of financial markets, and dwarfs the regulations that accompanied all other legislation enacted during the Obama administration. RegData, an online interactive tool, allows us to quantify the regulatory surge of Dodd-Frank in context. By analyzing the text of regulations and counting the words and phrases that signify a mandatory or prohibited activity—such as shall, must, may not, prohibited, and required—RegData gives a more meaningful measure of regulation than simply counting the number of new rules created or the number of pages added to the Federal Register. Because agencies must cite their legal authority for each regulation, RegData can match the restriction count found in regulations produced by regulatory agencies to the parts of the US Code that house the codified text from the Dodd-Frank Act. 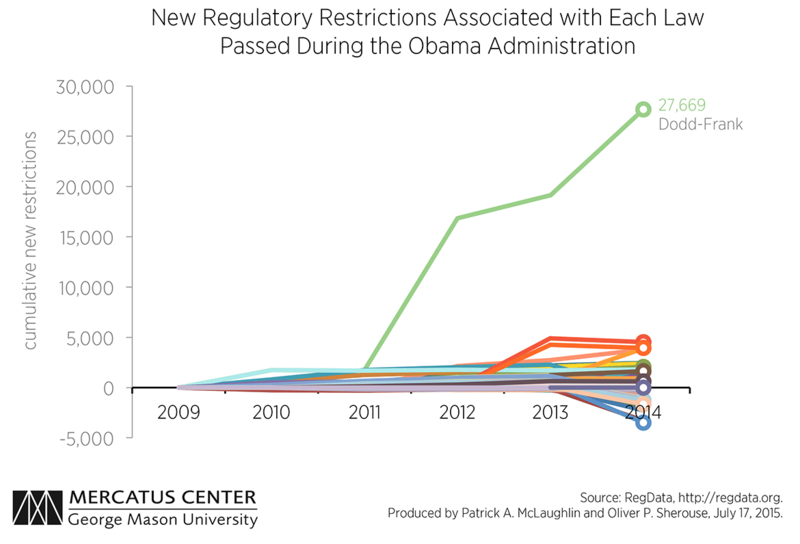 The first chart below shows the number of new restrictions for all laws passed during the Obama administration through 2014. Dodd-Frank, highlighted, stands out sharply from the crowd. It is associated with more than five times as many new restrictions as any other law passed since January 2009, for a total of nearly 28,000 new restrictions. In fact, it is associated with more new restrictions than all other laws passed during the Obama administration put together, as shown in the second chart below. 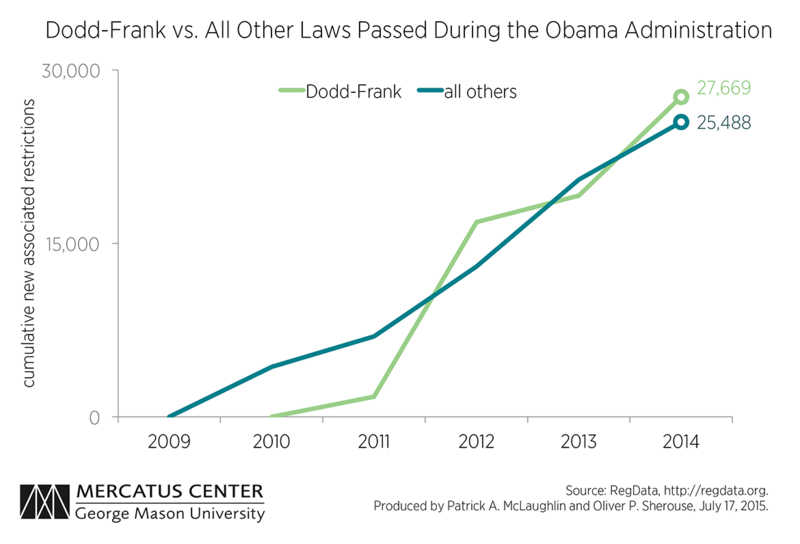 Dodd-Frank not only looms large in its effect on the pace of rulemaking when compared to other recent laws, but it also stands out from historical financial regulation. 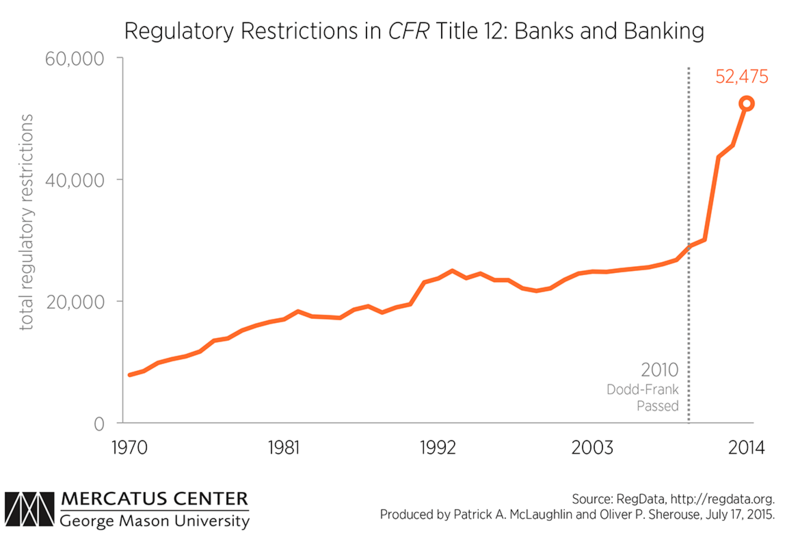 The third chart shows the number of restrictions in Title 12 of the Code of Federal Regulation, which is titled Banks and Banking. The passage of Dodd-Frank is marked with a dotted line. The number of regulatory restrictions in Title 12 had generally trended up since 1975 with occasional peaks and valleys, including a slight decrease in the mid-to-late 1990s. The increase in restrictions following the passage of Dodd-Frank, however, dwarfs all increases seen in previous periods. More regulatory restrictions were added to Title 12 from 2010 to 2014 than the entire title contained in 1980.